This historic fan shop was first opened around 300 years ago, and it has operated continuously ever since. Among all of Japan’s fans, Kyo-Sense made fans are recommended for their quality and durability. Of course they last longer, and some of them are infused with subtle fragrance. A line of other small items feature pictures of dancing Maiko girls. Also, when in doubt about what item to choose, you can easily ask the store clerks who speak both English and Chinese. Fans with lovely patterns are lined up, most with flower designs. They come with a bag in which to put the fan and its bamboo box. Some fans are scented. Find them by sniffing the lovely aromas. Lovely Maiko pictures drawn with a unique touch. Items include fans, purses, and lined handkerchiefs. These glasses cases are made with fine materials of soft texture. The hard cases make them durable. Available in ten colors. A strap to attach to your smart phone or other item. A startlingly small size. This item is very popular with foreign tourists. Available in two colors (white and black). *The photo shows the white color. Our fan recommendations will differ depending on your gender and your intended use. 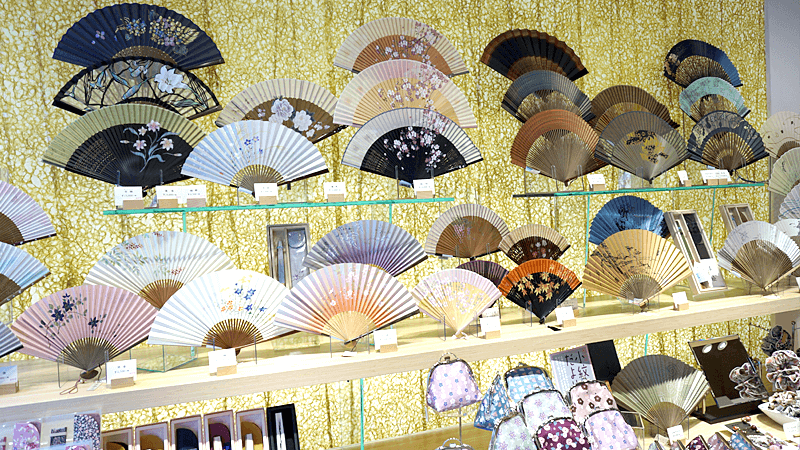 For example, "Kazari Fans" are folding decorative fans that are not made for actual fanning. If you are unsure which to choose, please consult with a store clerk. • We want you to actually pick up a fan and use it to see how well it works for you. However, please don’t treat the merchandise roughly. • After you buy a fan, you can go up to the shop’s second floor to play a fan-throwing game. If you get a high score, you can win a gift as a prize. Decorative fans are recommended for customers who live in cold regions. Please find and pick your favorite colors and patterns. It gets crowded at times because the shop is small, but please don't hesitate to stop by. No information in English is available.